Chrichton's World: Review Out for Justice (1991): Seagal goes full Brooklyn. Or at least tries to! Review Out for Justice (1991): Seagal goes full Brooklyn. Or at least tries to! 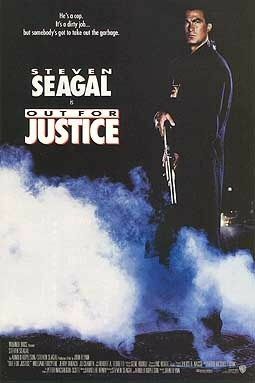 Out for Justice is regarded as Steven Seagal's best or at least one of his best. And I have to admit that after the first time I had watched it (many moons ago) I thought the same. But now? Not really. I know that this opinion isn't popular but it needs to be said. There is a lot wrong with this film that will prevent you from enjoying the film on multiple viewings. For starters the action isn't as exciting or top notch as claimed. It's brutal and bloody but that's all there is to it. Seagal does his Aikido thing on occasion but not as much as in previous films. The battle between Sticks (Dan Inosanto) and Gino (Steven Seagal) could have been one of the highlights in the film but unfortunately the fight fizzles out in a generic and uneventful struggle. Most fights end too quickly and Gino very rarely gets hit or hurt. With lack of real context and incentive it never felt like there was something at stake. Even with William Forsythe as the out of control baddie it didn't feel like there was an urgency to apprehending him. Normally I like Forsythe because usually he plays characters with many layers. Here he is just despicable. I can't imagine mobsters tolerating such hotheaded members in their ranks. He is the type who shoots you when you look at him funny. In the film the explanation given for his behaviour is his excessive drug use. Like he never was evil before that.I am sure he was asked to play it this way but it was over the top without actually being entertaining. Strangely enough the better moments in the film are the ones where Gino exchanges stories with mobsters. But then there a dozen other conversations where Seagal proves (or tries to prove) he can do a Brooklyn accent. And even can speak Italian. I truly wished he didn't. It was laid on so thick that it became laughable. Then Seagal acts like a prick against everyone except his dog and wife. Remember we are supposed to root for him. I don't care if he is a cop or not. That alone is not enough. Speaking of the dog. Someone threw a puppy out of his car and Gino picks and adopts it on the spot. At least he loves animals. Does this make him more likeable? Yes. But then there is also a scene where Gino beats up a pimp because he abused one of his hookers. Gino chastises him for hitting women. A bit ironic coming from an alleged wife beater. Out for Justice has a duration of 92 minutes. But it sure felt like it was much longer. In my book that is never a good sign. Overall it is one of the better films made by Seagal but it isn't nearly good enough to be called a classic.